Web Processing Services (WPS) are web services that can be used perform geoprocessing and other processing activities for apps. The Open Geospatial Consortium (OGC) has created the WPS interface standard that provides rules for how inputs and outputs for processing services should be formatted. Using the Web Processing Services API, you will be able to provide processing capabilities for your apps using any service that conforms to the OGC WPS standard. For convenience, the 52 North WPS is provided as part of the Tethys Platform software suite. 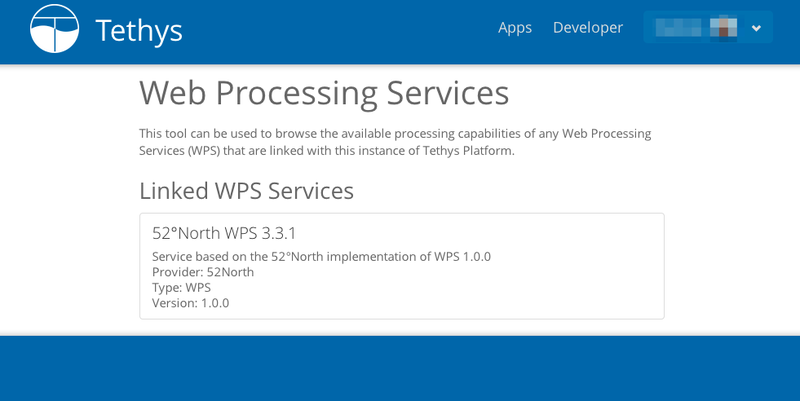 Scroll to the Tethys Service section of the Admin Interface and select the link titled Web Processing Services. Click on the Add Web Processing Services button. Fill in the connection information to the WPS server. Press the Save button to save the new WebProcessingService. You do not need to create a new WebProcessingService for each WebProcessingServiceSetting or each app. Apps and WebProcessingServiceSettings can share WebProcessingServices. 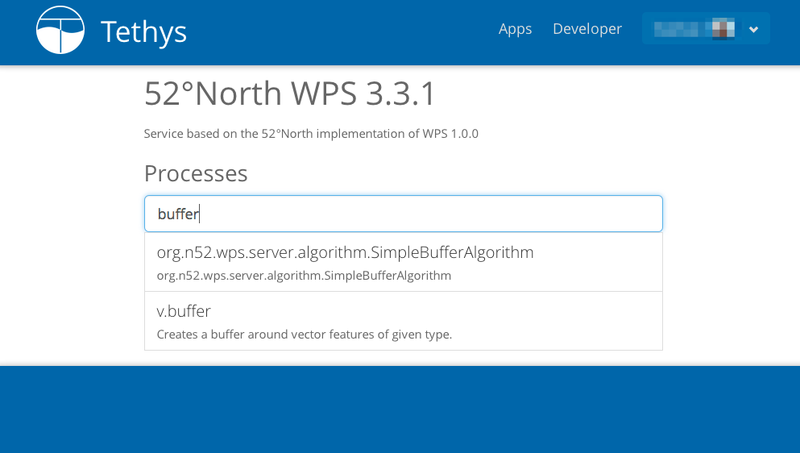 Scroll to the Web Processing Service Settings section and locate the WebProcessingServiceSetting. If you don't see the WebProcessingServiceSetting in the list, uninstall the app and reinstall it again. Assign the appropriate WebProcessingService to your WebProcessingServiceSetting using the drop down menu in the Web Processing Service column. During development you will assign the WebProcessingService setting yourself. However, when the app is installed in production, this steps is performed by the portal administrator upon installing your app, which may or may not be yourself. The Web Processing Service API is powered by OWSLib, a Python client that can be used to interact with OGC web services. For detailed explanations the WPS client provided by OWSLib, refer to the OWSLib WPS Documentation. This article only provides a basic introduction to working with the OWSLib WPS client. Alternatively, you can create an owslib.wps.WebProcessingService engine object directly without using the convenience function. This can be useful if you want to vary the credentials for WPS service access frequently (e.g. : to provide user specific credentials). 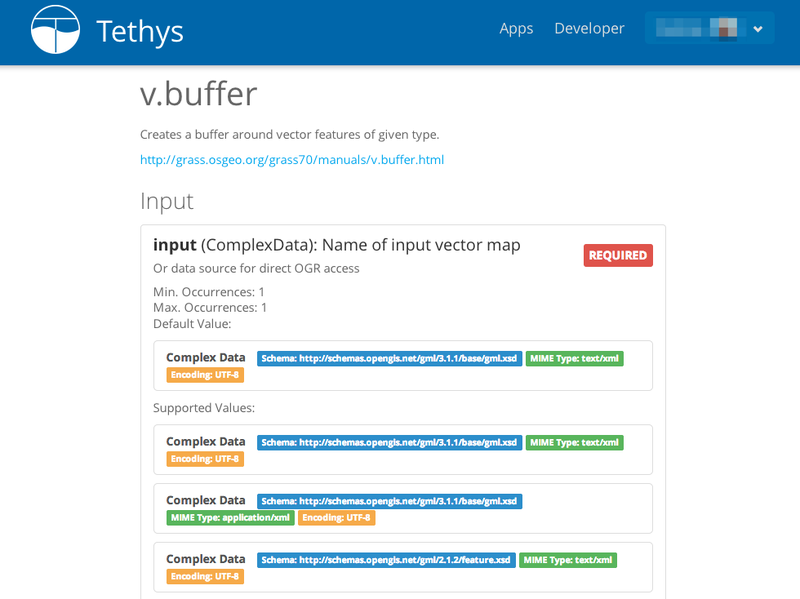 It is also possible to perform requests using data that are hosted on WFS servers, such as the GeoServer that is provided as part of the Tethys Platform software suite. See the OWSLib WPS Documentation for more details on how this is to be done. Browse to the Developer Tools page of your Tethys Platform by selecting the "Developer" link from the menu at the top of the page. 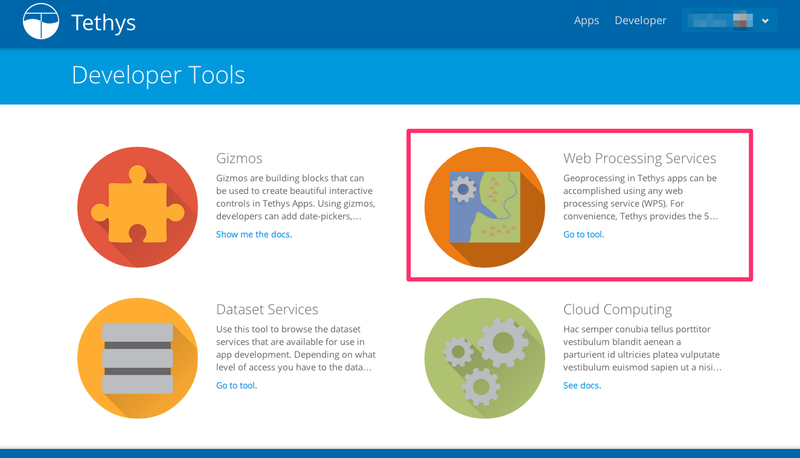 Select the tool titled "Web Processing Services". Select a WPS service from the list of services that are linked with your Tethys Instance. If no WPS services are linked to your Tethys instance, follow the steps in Sitewide Configuration, above, to setup a WPS service. Select the process you wish to view. A description of the process and the inputs and outputs will be displayed.